The basic building blocks of the Silverstack library are projects, bins and folders. Every project you create in Silverstack contains by default different kinds of “Smart Folders” and a “Volumes” sub-item. Based on that you can add an unlimited number of folders, bins and smart folders by right-clicking on any item of the project tree. A “Project” groups all information and data of a single project. In Silverstack all clips, jobs, volumes and destinations are assigned to one project. It may additionally contain information like the producer, name of the DIT or a production logo, which you can edit in the Statistics overview of the selected project. The number behind every element of your project tree indicates the number of versions it contains, whereby duplicates are not counted. The number behind your “Project” item indicates the number of versions contained by it, with only counting one version of each referred clip. 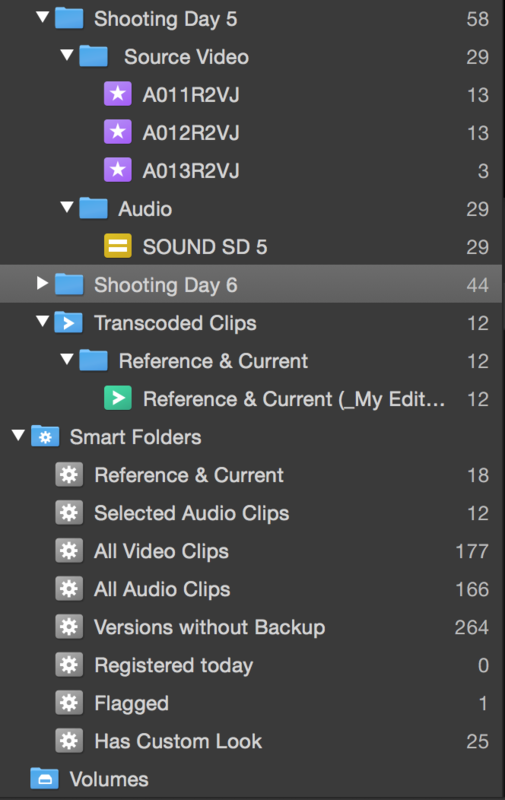 A bin contains clip versions, but no other bins or folders. It is the smallest container unit in Silverstack. Bins are the only element to contain versions directly, folders and projects only group a set of bins. Custom Order: Reflects and stores the custom order the user created with drag & drop. Name (A-Z): Sorts bins and folders by Name from top to bottom from 0 to Z. Name (Z-A): Sorts bins and folders by Name from top to bottom from Z to 0. Date (oldest – newest): Sorts bins and folders by creation date, oldest date first, newest date last. Date (newest – oldest): Sorts bins and folders by creation date, newest date first, oldest date last. Folders stay on top. Audio bins are automatically sorted separately at the bottom of video bins. 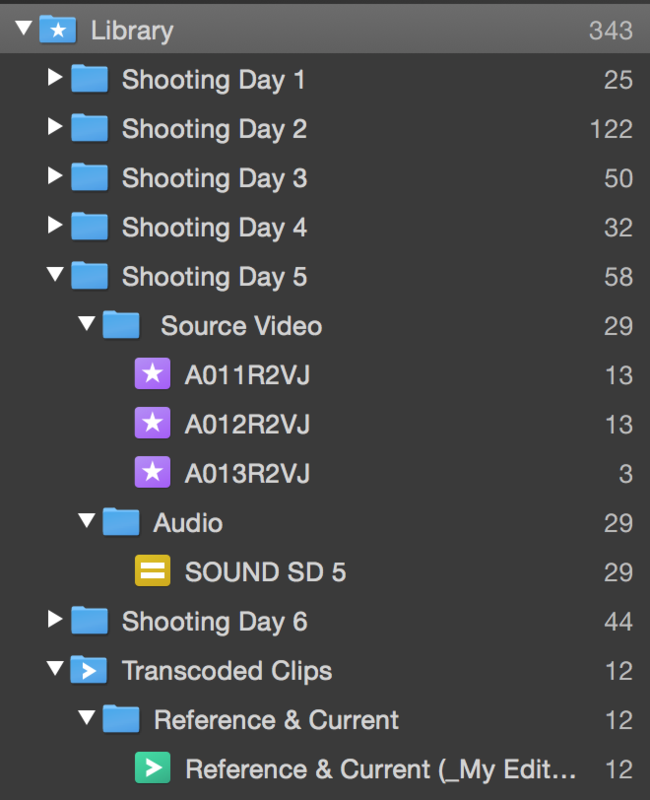 Folders are used to create logical project structures like shooting days. A folder can contain bins and other folders but not clips directly since clips always have to be enclosed by a bin. Additionally there is an element called “Smart Folders” in the Silverstack library, which describes a folder with integrated filtering function. 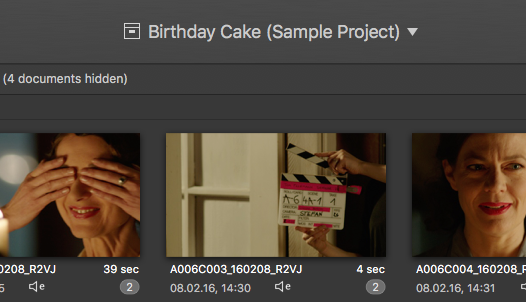 Using smart folders you can find clips with a certain attribute in the dedicated project very easily. 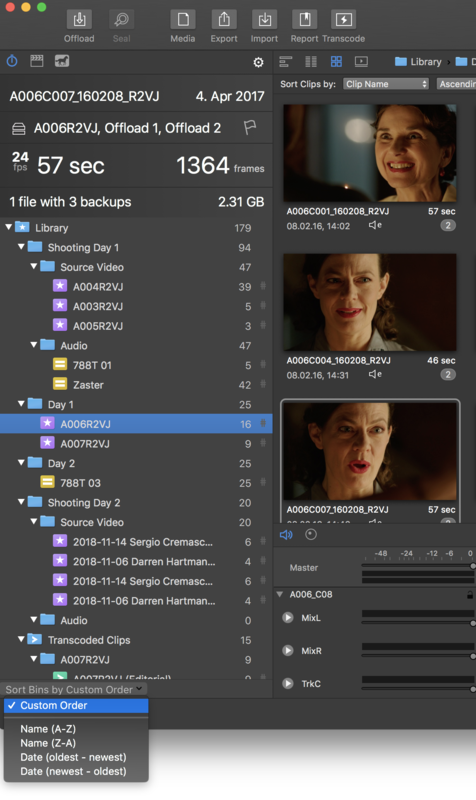 The default smart folders filter the library for clips without backups, with a high rating, a flagging or clips that are registered today. For a closer look to the smart folder section go to the Working with smart folders article. By selecting “Volumes”, Silverstack outlines all used storage devices and their according information. 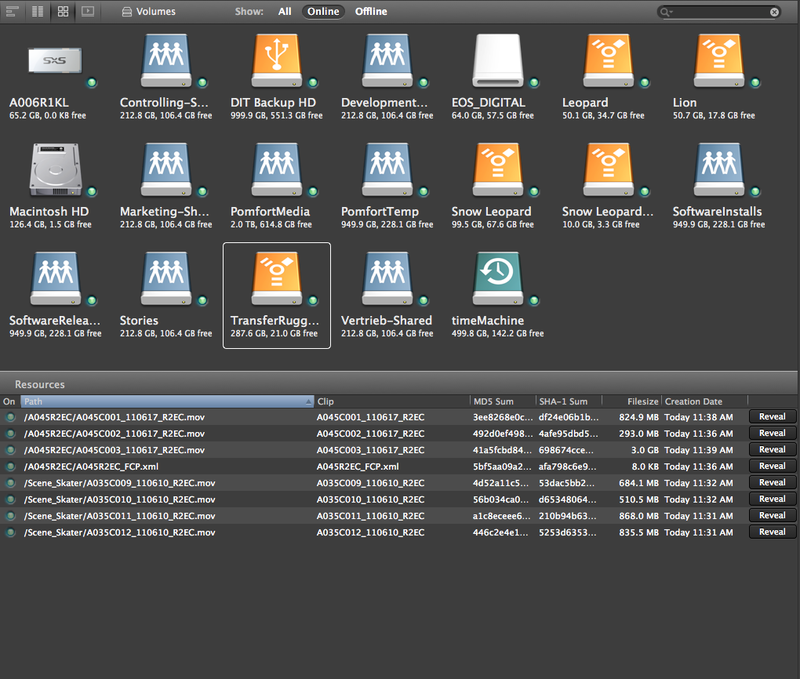 You can also reveal the files in the finder by clicking the reveal button. Additional information about your volumes can be found in the right sided panel. There you have the possibility to make comments, eject the volume, get the status of your free disk space print a volume report or give your hard-drive a playback priority.